Twenty years ago, the Wheaton Alumni magazine began a series of articles in which Wheaton faculty told about their thinking, their research, or their favorite books and people. 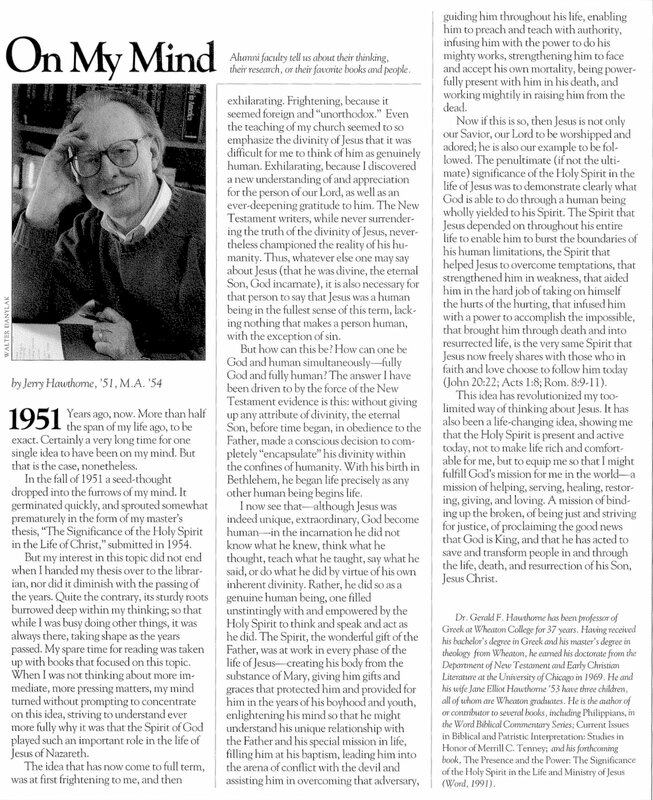 Professor of Greek Emeritus Gerald Hawthorne (who taught at Wheaton from 1953-1995) was featured in the June/July 1991 issue. 1951. Years ago, now. More than half the span of my life ago, to be exact. Certainly a very long time for one single idea to have been on my mind. But that is the case, nonetheless. In the fall of 1951 a seed-thought dropped into the furrows of my mind. It germinated quickly, and sprouted somewhat prematurely in the form of my master’s thesis, “The Significance of the Holy Spirit in the Life of Christ,” submitted in 1954. But my interest in this topic did not end when I handed my thesis over to the librarian, nor did it diminish with the passing of the years. Quite the contrary, its sturdy roots burrowed deep within my thinking; so that while I was busy doing other things, it was always there, taking shape as the years passed. My spare time for reading was taken up with books that focused on this topic. When I was not thinking about more immediate, more pressing matters, my mind turned without prompting to concentrate on this idea, striving to understand ever more fully why it was that the Spirit of God played such an important role in the life of Jesus of Nazareth. The idea that has now come to full term, was at first frightening to me, and then exhilarating. Frightening, because it seemed foreign and “unorthodox.” Even the teaching of my church seemed to so emphasize the divinity of Jesus that it was difficult for me to think of him as genuinely human. Exhilarating, because I discovered a new understanding of and appreciation for the person of our Lord, as well as an ever-deepening gratitude to him. The New Testament writers, while never surrendering the truth of the divinity of Jesus, nevertheless championed the reality of his humanity. Thus, whatever else one may say about Jesus (that he was divine, the eternal Son, God incarnate), it is also necessary for that person to say that Jesus was a human being in the fullest sense of this term, lacking nothing that makes a person human, with the exception of sin. But how can this be? How can one he God and human simultaneously–fully God and fully human? The answer I have been driven to by the force of the New Testament evidence is this: without giving up any attribute of divinity, the eternal Son, before time began, in obedience to the Father, made a conscious decision to completely “encapsulate” his divinity within the confines of humanity. With his birth in Bethlehem, he began life precisely as any other human being begins life. I now see that–although Jesus was indeed unique, extraordinary, God become human–in the incarnation he did not know what he knew, think what he thought, teach what he taught, say what he said, or do what he did by virtue of his own inherent divinity. Rather, he did so as a genuine human being, one filled unstintingly with and empowered by the Holy Spirit to think and speak and act as he did. The Spirit, the wonderful gift of the Father, was at work in every phase of the life of Jesus–creating his body from the substance of Mary, giving him gifts and graces that protected him and provided for him in the years of his boyhood and youth, enlightening his mind so that he might understand his unique relationship with the Father and his special mission in life, filling him at his baptism, leading him into the arena of conflict with the devil and assisting him in overcoming that adversary, guiding him throughout his life, enabling him to preach and teach with authority, infusing him with the power to do his mighty works, strengthening him to face and accept his own mortality, being powerfully present with him in his death, and working mightily in raising him from the dead. Now if this is so, then Jesus is not only our Savior, our Lord to be worshiped and adored; he is also our example to be followed. The penultimate (if not the ultimate) significance of the Holy Spirit in the life of Jesus was to demonstrate clearly what God is able to do through a human being wholly yielded to his Spirit. The Spirit that Jesus depended on throughout his entire life to enable him to burst the boundaries of his human limitations, the Spirit that helped Jesus to overcome temptations, that strengthened him in weakness, that aided him in the hard job of taking on himself the hurts of the hurting, that infused him with a power to accomplish the impossible, that brought him through death and into resurrected life, is the very same Spirit that Jesus now freely shares with those who in faith and love choose to follow him today (John 20:22; Acts 1:8; Rom. 8:9-11). This idea has revolutionized my too-limited way of thinking about Jesus. It has also been a life-changing idea, showing me that the Holy Spirit is present and active today, not to make life rich and comfortable for me, hut to equip me so that I might fulfill God’s mission for me in the world–a mission of helping, serving, healing, restoring, giving, and loving. A mission of binding up the broken, of being just and striving for justice, of proclaiming the good news that God is King, and that he has acted to save and transform people in and through the life, death, and resurrection of his Son, Jesus Christ. 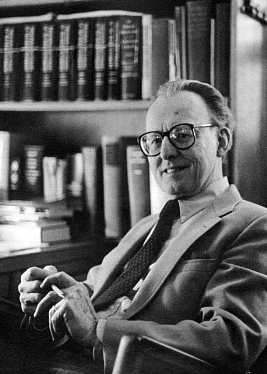 Dr. Gerald F. Hawthorne was a professor of Greek at Wheaton College for 42 years. Having received his bachelor’s degree in Greek and his master’s degree in theology from Wheaton, he earned his doctorate from the Department of New Testament and Early Christian Literature at the University of Chicago in 1969. He and his wife Jane Elliot Hawthorne ’53 have three children, all of whom are Wheaton graduates. He is the author of or contributor to several books, including Philippians, in the Word Biblical Commentary Series; Current Issues in Biblical and Patristic Interpretation: Studies in Honor of Merrill C. Tenney; and The Presence and the Power: The Significance of the Holy Spirit in the Life and Ministry of Jesus (Word, 1991). Gerald Hawthorne died on August 4, 2010.